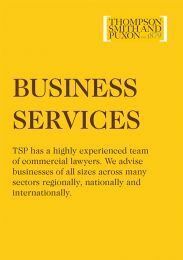 Whether you need legal advice on a business deal, property transaction, employment issue or a dispute of any kind, the TSP Business Services team can help. The team have created a “Guide to Business Services” which highlights the areas in which they are able to help your business. To download your copy please click here. The Business Services team provides a full-service approach drawing on the individual expertise within the firm to provide a complete and seamless service. The relationships developed with our business clients ensure a true partnership approach exists with a focus on achieving our clients’ end-objectives. As the business environment becomes increasingly complex and competitive, we recognise the importance to you of having the best legal advice to guide you each step of the way.